All Star Wars movies in chronological order! 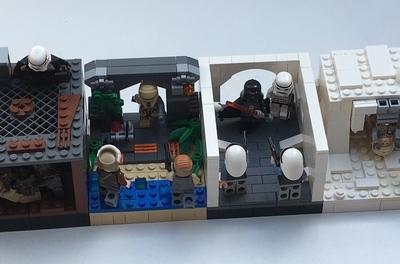 This set captures the iconic form of Darth Vader's and Luke Skywalker's Return of the Jedi lightsabers in brick-built Lego form. 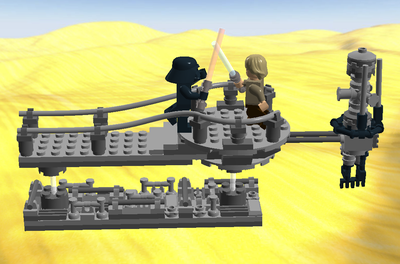 My idea is to allow us mere humans not in that galaxy far, far away to participate in the age-old Jedi and Sith tradition of completing our skills and building by offering a set that allows us to build two of the most iconic lightsabers in the Star Wars universe. Just like the "real thing" each lightsaber has a crystal inside. These lightsabers are sturdy enough to withstand being handled and sturdy enough to support the blade concept. Furthermore, I want to make these hilts as realistic as possible to pass off as a prop for a costume (for people who are into that sort of thing)...they can take the abuse of a convention crowd! I proudly showed these off at Megacon 2013. 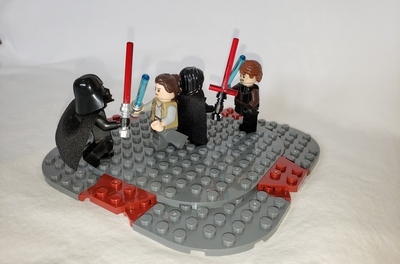 Based on the new project guidelines, this set has evolved into a stand alone set that includes two iconic lightsabers of the Star Wars Universe and the movie Return of the Jedi...Darth Vader and Luke Skywalker. Based on your feedback, these are the two lightsabers you have expressed the most interest in, and these are the lightsabers I have decided to go forward with. Find this project on Facebook! 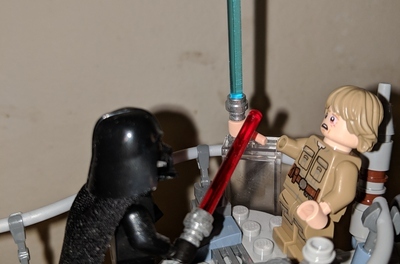 This set include a Luke and Vader minifigure, two brick built lightsabers, and a display stand. Each lightsaber has a crystal inside of it! Blade concept! Each lightsaber is designed to have a brick built blade attach to the hilt. Not strong enough for dueling, but strong enough for looking awesome!